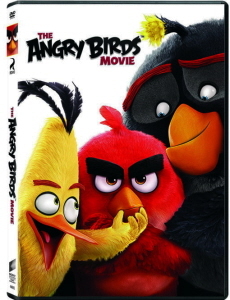 When I first heard that an Angry Birds full length CG animated feature film was in the works years ago, my initial reaction was a common one: how in the world are they going to fill an hour and a half’s worth of screen time based on a game with virtually no story whatsoever? The answer, it turns out, is very, very easily. And why not? Films like Illumination’s Minions and DreamWorks’ Penguins of Madagascar have taught us that rich plots aren’t necessary to deliver a couple hours of mindless digital escapism. Sony, no stranger to proper film-making techniques, took all the right moves with this one: Assemble a cast known for comedic presence and good timing, draw from a witty screenplay that isn’t overly simplistic or complex (by Simpsons alum Jon Vitti), keep the visuals bright, cheerful and accessible and the rest will take care of itself. First-time feature directors Clay Katis and Fergal Reilly, both longtime studio animators with major Disney and Warner Bros. credits to their names were brought on to helm the project for good measure. Did the efforts pay off? Considering the film was made on a budget of $73-mil and managed to take in $350-million at the box office alone, that is about as resounding a yes as imaginable. Given the way Hollywood studios work; these types of profits assure that this will not be the last we hear of CG animated Angry Birds films. 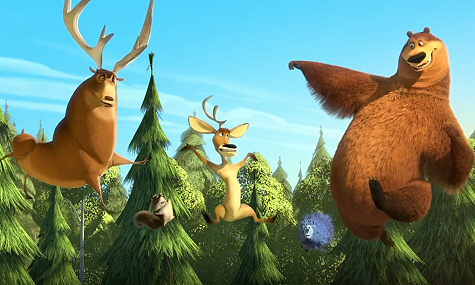 But we’re here to talk about this one and right from the opening scene, a very Ice Age-esque segment where the film’s main protagonist Red (Jason Sudeikis) races through a jungle carrying a gluten-free cake while encountering obstacles of endless bodily abuse, it becomes clear that the laughs are going to come quickly and relentlessly. Red, it turns out, is a party clown for hire and when his would-be customers push his buttons past the breaking point, it’s off to anger management class for our short-fused hero. 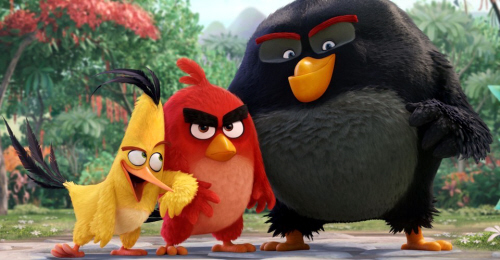 It’s here he meets Bomb (Danny McBride) and Chuck, a speedy yellow bird (Josh Gad aka Olaf the Snowman from “Frozen”). Thus unlikely trio’s time spent “reforming” is short lived when a ship full of deceptive green pigs washes ashore with agendas all their own. 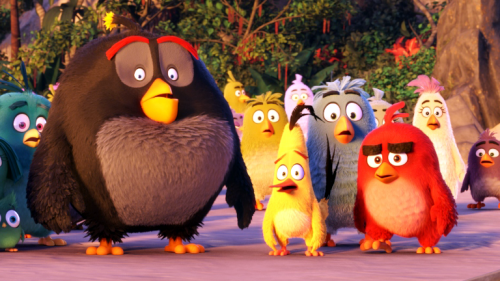 The pacing of Angry Birds is surprisingly efficient; reminiscent even to the impeccable scene-splicing work of DreamWorks in fact. Puns and double entendres abound within the dialog but never is it off-putting enough to offend young ears. Older ears, however, will likely find much to chuckle about here. If you’re in the market for some lighthearted laughs and a quickly paced romp laced with lovely tropical visuals, look no further. Just remember; not unlike the app upon which this film is based, expect the concept of squashing little green pigs into mush to make a whole lot of sense. 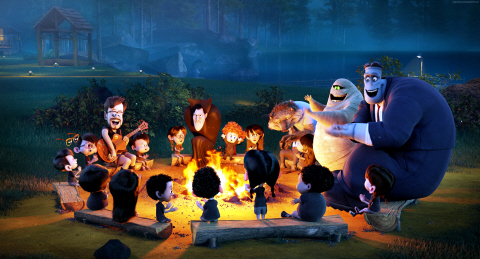 Back in 2012 when Sony, under Genndy Tartakovsky’s direction, released the star-studded monster comedy Hotel Transylvania upon the world, it seemed like a simple formula for success. In fact that’s exactly what it turned out to be, turning its 85-million dollar budget into $358.4-million at the box office alone. Most importantly, perhaps, is that those kind of profits assure beyond any shadow of a doubt that sequels will follow. 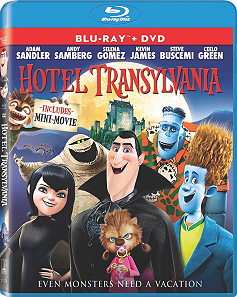 And follow they have- in September of 2015 Hotel Transylvania 2 was released once again under Tartakovsky’s directorial efforts only this time leading voice actor Adam Sandler co-wrote the script to insure maximum laughs. The budget was $80-mil (rare that a sequel to so successful a debut would have a smaller budget) and the film managed to collect a cool $473-million at the box office this time. Less money to produce and even larger profits mean you can bet your high-collared cape this isn’t the last we’ll be hearing from Hotel Trans. 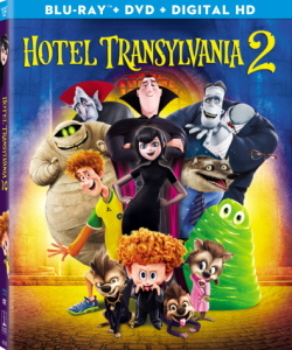 The story in Hotel Transylvania 2 doesn’t bother treading old territory but rather picks up with events just as we left them at the conclusion of the first movie: Drac’s (Sandler) daughter Mavis (Selena Gomez) ties the knot with dopey human suitor Jonathan (Andy Samberg) and a wedding at the hotel means human guests amongst monsters. -You may remember from the first film that even a single human was a terrifying prospect for the monsters. From the gags of such intermingling, the viewer is quickly whisked along life’s highway as the couple announce they’re pregnancy, have a baby boy, and discover a bit of trouble when the lad (Dennis) doesn’t seem to be following in the family’s vampiric traditions. Could he be just a “late fanger”? Could Drac (and his even nastier father Vlad voiced by Mel Brooks) love their grandson if he was more human than monster? Will Mavis just give up on the whole hotel altogether and move to California with her in-laws so that Dennis can hope to grow up normally among humans? These are just some of the sleep-depriving questions Hotel Transylvania 2 presents and if it all sounds a bit contrived, that’s because it is. Depth of plot or awards for best drama aren’t the name of the game here but that doesn’t mean there aren’t a few laughs to be had with Steve Buscemi reprising his role as the Wolfman, Kevin James as Frankenstein, David Spade as the Invisible Man and even John Lovits as the Phantom of the Opera. The jokes are new but the gags largely unchanged. About the biggest problem I found with the piece is that its pacing is far from even. In one sense it’s doing its best to offer up some heavy handed themes of individualism, political correctness, unconditional parental love and so on but then in another it sorts of dares its viewer to stop worrying about lessons and just laugh at the silliness. This isn’t an inexcusable crime by itself (after all, the kids will likely be enamored with the slapstick anyway), the bigger problem here is that the film attempts so much in its 89-minutes that certain things drag on unnecessarily while other touchstone moments (like marriage and childbirth) are glanced over at blink-and-you-missed-it speeds. I suppose another way of saying it: the pacing in the first film is vastly more organized than how things come together in the second. On the other hand, if you were the type of viewer who enjoyed the shtick of Drac being a bit overprotective (over-imposing?) of daughter Mavis in the first film, get ready for overload status in the second. Thankfully for most of the movie Drac and Mavis aren’t in the same locale, which provides many more opportunities for effects-laden monster mischief; the fire effects in particular have gotten to the point of photo-realism here. 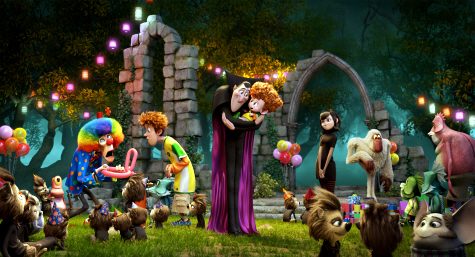 All in all, Hotel Transylvania 2 is an enjoyable romp despite being slightly unsure of precisely how serious to take itself. Fans of the original will likely find much to enjoy here. The gags are pretty continuous and a few of them are funny enough to atone for some of the cornier ones. By no means the film reinvent the CG medium but it builds upon many of the same elements that made the first film memorable. Oh and that was no mere conjecture in my stating the sequels are a coming. Part 3 is already in the works for a 2018 release and an animated television series is set to drop in early 2017. Sony’s been around long enough to know there is no sense fixing that which isn’t broken. On the whole children’s books make for some excellent source material for computer generated features. And why wouldn’t they? They’re typically cute stories for viewers of all ages rife with bright artwork and laced with some sort of life-lesson for good measure. 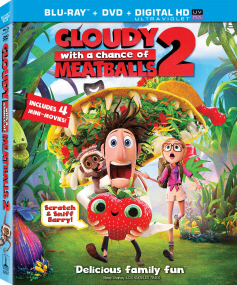 And such was the reasoning behind Sony Pictures Animation’s 2009 big screen adaptation of the 1978 children’s book Cloudy with a Chance of Meatballs. While the source material was pretty simplistic, Sony managed to scrape quite a memorable and charming tale of what was there. 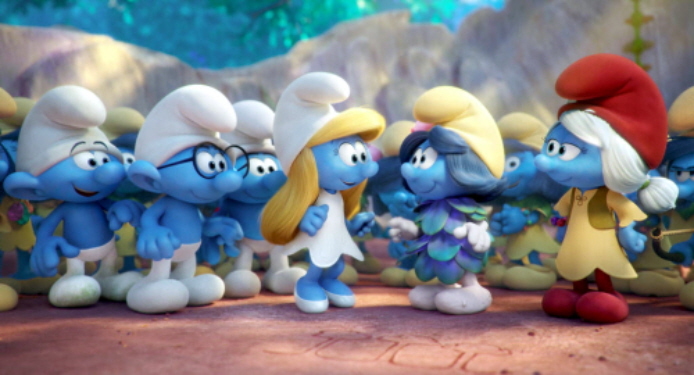 Perhaps due to a wonderful voice ensemble, layers of humor that appealed to kids and adults alike, unique visuals or some combination of the three- the original Cloudy sort of came out of nowhere and managed to dazzle just about all who encountered it thus explaining how it turned its $100-million budget into $243-mil (gross) worldwide. 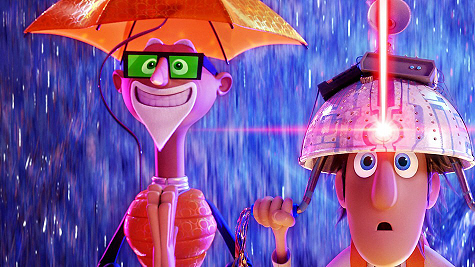 As is expected in Hollywood, no money-making stone remains unturned and a sequel was all but inevitable and 4-years after the original film, we got Cloudy with a Chance of Meatballs 2, which, interestingly opted not to acknowledge the literary sequel (Pickles to Pittsburgh) and instead continue on with the plot, characters and settings established in the first film. 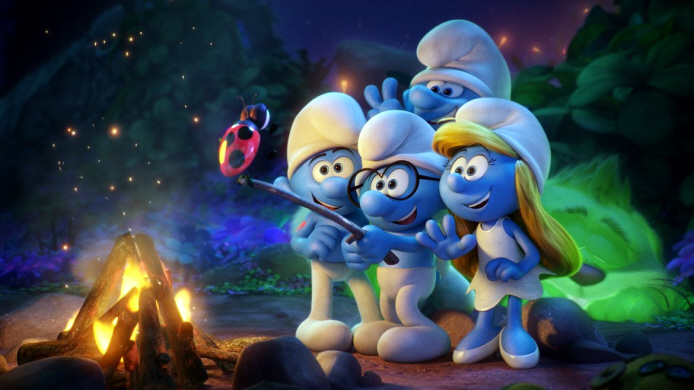 The film actually opens with a brief recap of events taking place in the first movie, mainly that Flint Lockwood’s (Bill Hader) FLDSMDFR (Flint Lockwood Diatonic Super Mutating Dynamic Food Replicator) was blown up at the conclusion of the first adventure but apparently wasn’t destroyed in the process. Buried in mountains of uneaten and mostly gigantic food; the citizens if Swallow Falls, though relieved to be alive, are faced with the daunting task of industrial caliber cleanup. Fortunately the United Nations, aware of the fact that almost every city on the planet suffered the consequences of Flint’s invention enlist the aid of revolutionary tech company, Live Corp for the actual cleanup. Flint is awestruck when he discovers his childhood idol; scientific mogul Chester V (Will Forte) is leading the job personally. What’s more- Chester enlists Flint directly to try to track down the rogue food-making machine so as to deactivate it once and for all with a device known as the BS-USB. Lockwood, his girlfriend Sam Sparks (Anna Faris), dad Tim (James Caan), monkey Steve (Neil Patrick Harris), Baby er I mean Chicken Brent (Andy Samberg), overzealous cop Earl (Terry Crews replacing Mr. T.) and jack-of-all-trades Manny (Benjamin Bratt) travel from their temporary digs in San Franjose back to Swallow Falls which has apparently become overrun by a bizarre race of sentient food/ animal hybrids called, you guessed it: Foodimals. What results is a pretty whimsical adventure/ expedition piece rather reminiscent of the later Jurassic Park films with heards of stampeding “unnatural” animals, adorable talking fruits, massive gentle giants and puns aplenty littered throughout a tropical jungle where once civilization existed. There’s some good news and bad news in this- The good is that the writers of the sequel had to waste very little time developing their characters this time around as it is a literal continuation of characters (and actors), sets and even circumstances of the first movie. The bad news is lack of character development nips this piece in its proverbial backside almost constantly to the point that the finished product doesn’t feel like a solidly constructed story so much as a series of set-ups and plot devices to simply get the viewer to the next marquee moment. Yes, a lot of these marquee moments are clever, witty, creative and often funny, the problem is they come at the expense of the one thing the first film had in abundance: heart. Make no mistake, this film manages to hit all of its marks and at times feels perhaps a bit too reformed and revised for its own good. Kids will likely be enthralled with the ridiculously lush color pallet and larger-than-life characters and adults, especially those for a penchant for tongue-in-cheek humor & puns will find many opportunities to giggle as well. In fact that leads me to about my biggest complaint of the piece: when judged on its own merit, it’s 95-minutes of pretty enjoyable and well-presented CG entertainment but it starts to feel a bit contrived and hollow when compared to the original. On paper all of the pieces for success are present- even some slightly muddled themes of vegetarianism and anti-corporatism and an ending that doesn’t quite offer the scale of resolve that the premise sets up, it’s still pretty tricky to come away from this one without a positive vibe and a few good laughs to boot. And at the end of the day, isn’t that exactly why we watch these types of movies in the first place? There’s a simple reality when it comes to computer generated feature films here in the United States- and that is simply that the DVDs and blu-Rays finding their way onto our store shelves, into streaming servers and into the RedBox are typically derived from one of two methods: Domestically written, produced and animated and then there are those that take the cheap way out- an American studio or distribution company picks up the rights to a foreign CG film, does their best to slap some English over the mismatched mouth flaps and passes it off as their own creation. To date, the latter has been disastrous and for good reason. Comedy pieces rely upon timing to deliver tight dialog. When an English language director is forced to incorporate lines that will match up with the timing and mouth flapping of a film originally intended for a different language, catastrophe is inevitable. No need to take my word for that- dozens upon dozens of films created using this process are released each year; Doogal, The Snurks, Dolphin the Story of a Dreamer, Legend of the Sea and so on (yes I’ve reviewed them all, archived here). 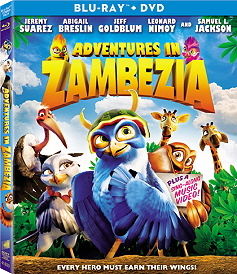 Enter Adventures of Zambezia from Sony Pictures Home Entertainment; a film that arrived to DVD and Blu on March 26th 2013 as a part of an exclusivity deal between Sony and Wal-Mart. Where things get really interesting is that this film doesn’t precisely fall into either of the two categories of production described above. 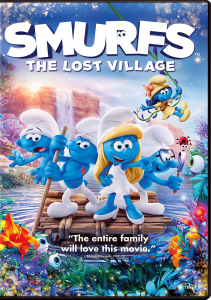 It was written and produced and animated by (English-speaking) Triggerfish Animation Studios out of South Africa but then brought here to the United States to be completed. As a result, rather than to record a dialog track of local actors, a fine Hollywood ensemble (including Samuel L Jackson, Jeff Goldblum, Leonard Nemoy, Abigail Breslin and Jeremy Suarez) was integrated right from the onset. Additionally, audio work was done through Skywalker Sound to ensure the quality and richness of sound effects and mixing American moviegoers have come to expect. Finally, since the film was scripted, storyboarded and animated to be in English, problems with sloppy timing, mismatched mouth flaps, and other ugliness associated with dubbing into another language are nonexistent. Technical nuances aside, you are likely reading this review to determine whether or not this film is right for a rental or purchase for you and yours and I’m pleased to report that for most, the answer is yes. Wearing a G (general audience) rating and coming in at a runtime of 83-minutes, Adventures in Zambezia manages to pack an awful lot of heart into its reputed $20-million budget (if that sounds like a lot to you, do keep in mind that Pixar’s Toy Story 3 boasted a budget ten times as large at $200-mil). The film is set within the wilds of Africa and centers on a young falcon named Kai (Jeremy Suarez) living in relative isolation with his father Tendai (Samuel L Jackson). 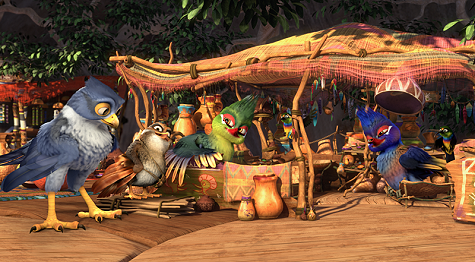 An unexpected visitor leads Kai to learn of Zambezia, a legendary city that promises sanctuary for nearly every bird on the globe. Tendai’s mysterious opposition toward the fabled city results in Kai’s desire to strike out on his own in the hopes of finding Zambezia in the eventual hope of joining the Hurricanes: Zambezia’s elite fighting force charged with protecting the city. Arriving to the destination is only the beginning as Kai must impress the arduous Hurricane leader Ajax (Jeff Goldblum), win over the approval of the small female firecracker Zoe (Abigail Brezlen), and discover why he never knew his mother from the wise village elder Chief Sekhuru (Leonard Nemoy). Larger conflicts are also brewing in the form of devious Marabous (the only birds excluded from Zambezia) and an alliance they form with the evil lizard Budzo (Jim Cummings) resulting in the kidnapping of Kai’s dad. Pacing is flawless right from the opening scene onward, a testament to (as one of the included featurettes attests) multiple drafting and story boarding prior to production. Visually, the film manages to dazzle as well (especially in high-definition). Character models are realistic but warm, textures are rich and colorful. It may not be quite as vibrant as Blue Sky’s Rio but it really isn’t far behind. 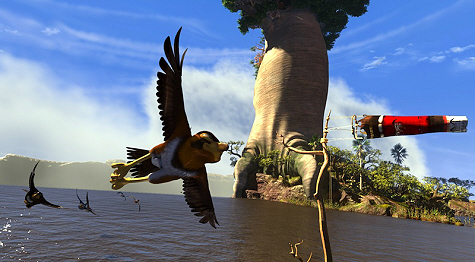 Also unlike Rio, Zambezia does away with the human element entirely, instead weaving its entire tale through its English-speaking animals. Musical scoring, sound effects and vocal casting are all incredibly solid and delivered in a gorgeous 5.1 Dolby Digital mix. Relative unknown Jeremy Suarez brings some welcome charisma to the character of Kai, Goldblum reminds through his trademarked dryness that he hasn’t lost touch with his comedic genius and even Samuel L breaks away from his usual straight-man with attitude routine to bring some warmth to Tendai. A host of interesting extras also grace the home release of the film; confirming the suspicion that a labor of love fueled the film’s production team up and over many of the hurdles associated with bringing a major motion picture to life. Fortunately their efforts were rewarded with the Best South African Feature Film award at the Durban International Film Festival in 2012. It also represents the first internationally released CG feature to come out of South Africa so its success is additionally exciting for all involved. Of course some will find fault in its lack of originality, risk-taking or Pixar/ DreamWorks level cleverness but make no mistake, such complaints fade away when the film hits all the right marks. To compare it to past domestic releases, it contains charm and tones reminiscent to Disney’s 2005 Valiant or Warner’s 2010 Legend of the Guardians: The Owls of Ga’Hoole. In conclusion, Triggerfish’s future appears quite bright on an International level with Adventures in Zambizia. 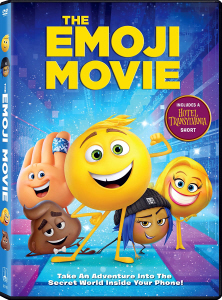 Fortunately the piece is no longer a Wal-Mart exclusive property and can now be picked up at most any retailer who deals in DVD and blu-Rays. Fall of 2012 was pretty exciting as far as animated features goes: Frankenweenie, Paranorman, Hotel Transylvania- if a trip to my local Cineplex didn’t cost roughly the same as the Gross National Product of Latvia; I imagine there could have been some seriously great memories made with a tub of popcorn and a warm hoodie. But alas, I digress. 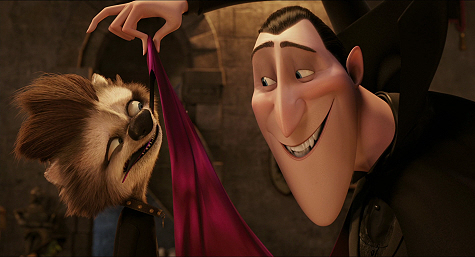 In my case, Hotel Transylvania had to wait for the home release and for the most part, it was quite enjoyable if entirely inappropriate seasonally. Hotel Transylvania is the $85-million dollar, 91-minute PG rated animated film rumored to have been in development for an abnormally long (even for an animated feature) six-years. 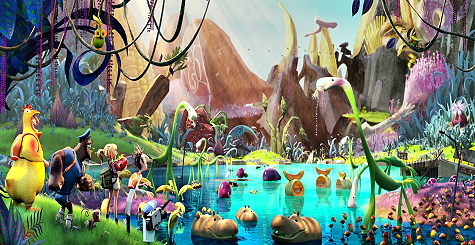 The end result lavishly uses the CG medium to reflect the direction and style of animator/director Genndy Tartakovsky. If that means nothing to you, imagine a slightly caricaturized version of the classic movie monsters complete with clichés and accents a plenty. While Sony’s Imageworks division rarely threatens Pixar or DreamWorks’ supremacy in the computer animated realm, the visuals are solid here with a good deal of background detail present that almost demands multiple viewings so fully absorb. The story, while certainly adequate, sadly never reaches much deeper than the previews alluded: In 1895, Count Dracula builds a resort in Transylvania, hidden away from the humanity, as a place for monsters to crash but also as a sanctuary to raise his daughter Mavis. Fast forward to present day and old Drac is busy inviting friends (among these Frankenstein and his wife Eunice; Wayne and Wanda werewolves; Griffin, the invisible man; Murray, the mummy; Bigfoot, among others) to the hotel so as to celebrate the 118th birthday of Mavis (18 in human years). Just as the party is about to get underway, a dopey 21-year-old human named Jonathan happens to stumble upon the hotel. Monsters, it turns out, fear humans the way, well, the way humans fear monsters. Ordinarily the Count would likely kick a wandering human to the curb (possibly short on a few corpuscles) but complicating matters is Mavis, who falls in love with the lad quite unaware that he is in fact a human. Undoubtedly the film’s greatest strength lies in its casting: Adam Sandler as Dracula, Andy Samberg as Jonathan, Kevin James as Frankenstein, David Spade as the Invisible Man, Steve Buscemi as Wolfman and on and on. One really gets the feeling that these guys could be reading random pages from a phonebook and elicit the giggles. That said, everyone plays really well off each other but never reach the type of comedic crescendo I sort of expected going in. Most of the humor is actually derived from visual gags (Frankenstein’s lower half releases some gas that gets blames on the unsuspecting Mummy, a female skeleton gets caught showering and tries to cover up despite having no physical features to hide and so on). Mark Mothersbaugh’s upbeat score is quite appropriate; reminding the viewer in even the darkest moments of the piece that the focal point here is laughter and silliness with love as the backdrop. The ending of the film does break out into a cheesy musical number that some may find a bit much but in all the audio is right up there with the visuals in terms of propelling the prose along. 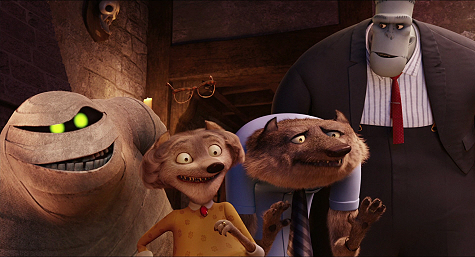 In all Hotel Transylvania is a success on most every level. 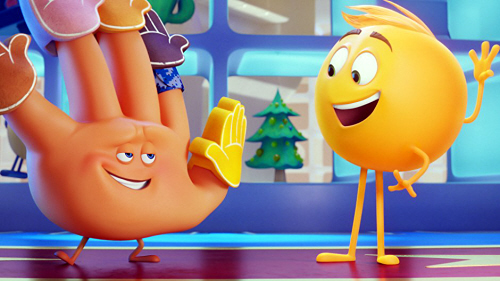 It lacks that Pixar creativity factor that continually results in the studio’s showering in awards but it’s solid through and through with visual charm that will keep the young ones entertained and enough layered wit for adults to enjoy as well. When you think of milking an animated film franchise for all it’s worth, usually DreamWorks comes to mind with properties like Shrek; that started out so original and comical but ended up feeling thin and worn out. Sony usually manages to duck the gun on such allegations because of the fact that they have such a smaller computer generated library in comparison but if the Open Season series is any indication, perhaps the finger need be pointed in their direction as well. 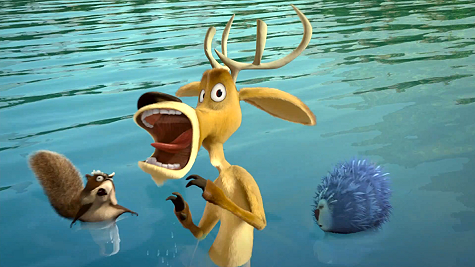 The funny thing, to me anyway, is that the first Open Season (2006) was an entirely run-of-the-mill affair that did its best to hang with the likes of similar “talking animal” CG pieces like the Madagascar(s), Over the Hedge, The Wild and so on. The visuals were passable (but never astounding), the plot decent (but nothing overly clever) and the characters, ah yes, the characters were pretty darn good. A lot of this credit is undoubtedly due to the casting choices: Martin Lawrence as the house-broken grizzly Boog, Ashton Kutcher as the obnoxious deer sidekick Eliot, Gary Sinise as the redneck hunter Shaw, and Debra Messing as Boog’s caretaker Beth. In short good characters managed to overcome the limitations of the plot structure and the humor found therein was genuinely appealing. Then came the sequel. 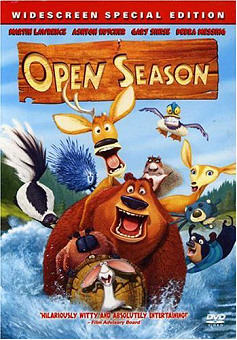 2008’s Open Season 2 was much, much weaker by comparison. Sony opted for a second rate cast, presumably to keep the budget down, bypassed the theatrical route (direct-to-dvd), and pretty much cut every corner possible in the production process. It had a little bit of residual charm but it was quite clear that Sony was simply capitalizing on the names/ appeal of the original. Enter 2010’s Open Season 3. How anyone could have figured replacing the B-list cast of the second film with a strictly C-list cast, cutting down the visuals budget and stretching the already paper-thin premise even further could result in anything short of disastrous is anybody’s guess. And disastrous it is! This time Boog gets stiffed by all of his friends on an annual “guys only” retreat and ends up trading places with a devious grizzly in the Russian circus. I wish to stretch this synopsis into a full paragraph, but no exaggeration: that’s about it. Perhaps I should also add that the domesticated cast (the dogs and cats) finds out that Boog’s in the circus and rally to mount a rescue attempt but this is it boys and girls… Modern story telling at its finest. The show’s production crew must have known that they had virtually nothing to work with here as indicated by the decision to revisit gags done to death the first two times around. Prepare for more abused rabbits, trashing of the mini-mart, and bad puns with Mr. Weenie’s misguided family structure. 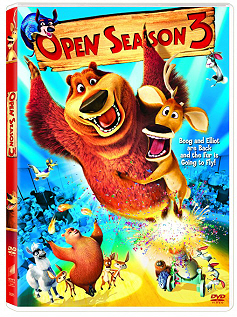 Further taking away whatever attempts at honest humor that the first film established, Open Season 3 makes the move to slap stick scenes complete with “cartoon” sound effects seemingly copied and pasted directly from Loony Toons. The pacing is abysmal but then again re-read my plot synopsis and then try to stretch that across 75-minutes. Naturally scenes are going to meander around relying upon clichés, bad puns and sorry gags to keep young viewers involved. Adults will often find themselves involuntarily cringing at the onscreen floundering. Perhaps this would simply be considered a substandard affair if not for the fact that it completely desiccates what little charm remained of its characters after their second outing. Formerly 3-dimensional characters are reduced to their absolute lowest denominator this time around: The once goofy but innocent Eliot has been condensed to a blathering moron, the antagonist Toy Poodle Fifi returns short a couple gonads with a whole bunch of neutering gags, and even the ever-chuckle-inducing Patrick Warburton (David Puddy of Seinfeld fame) has been axed as the overly-buff deer Ian. In all this is a sad display of what happens when a corporation discovers that one of their franchises has earned a place in pop-culture strong enough succeed by namesake alone then decides to exploit it for all its worth. This one may be passable to very young viewers or individuals easily amused by simple visual gags but everyone else (especially fans of the original film) will undoubtedly be left wanting their 75-minutes back. If the first Open Season was a testament to how to create layered humor that would appeal to multiple age groups, then the sequel is a cautionary tale as to what not to do. I thoroughly enjoyed the original and eagerly went into part 2 with similar expectations, the first of which earned suspicion when I noticed the Columbia Pictures logo was absent on the sequel’s DVD case (replaced with Sony Pictures Home Entertainment distribution). What this all means is direct-to-DVD territory. I remained optimistic as; after all, Sony Animation is no small-budget operation. The possibility remained that this would capture some of the charm of the original, even if budget cuts were inevitable. Conclusion after having invested $14 and 76-minutes: this one manages to do the impossible in undoing what was great about the first one. Boog and Elliot are back again but voiced by different actors in a tale that sets up a reluctant Elliot altar-bound when Mr. Weenie is kidnapped by his former owners and group of pampered pets. 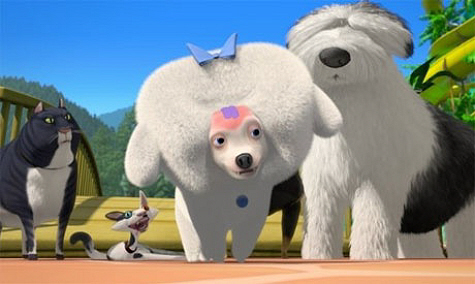 Boog, Elliot, McSquizzy, Buddy and Giselle launch a full-scale rescue mission for their sausage-shaped friend and soon find themselves in enemy camp: the world of domesticated pets. Led by a toy poodle named Fifi, the pets do not plan to let Mr. Weenie return to the wild without a fight. And thus the action begins. But the persona shifts are only a fraction of the greater issues plaguing this film. The cast swaps are the next nagging grievance. Martin Lawrence integrated a style to the Boog character that Mike Epps struggles (sometimes painfully) to emulate and the loss of Ashton Kutchor to the entirely overly enthusiastic Joel McHale as Elliott is really felt in conjunction with the weak scripting. The very plot itself is thin- with the Mr. Weenie angle proving that what little humor existed in the character the first time around worked best as a background element to the primary cast. Pacing is fairly methodic if a bit unsure of itself and that leads us to the real biggest crime this film commits: It really isn’t appealing to viewers of any potential age group. The plot and humor have crossed that delicate line where adults will enjoy it and the PG rating (which is well deserved thanks to endless sexual innuendos and references) will likely keep parents from feeling confident about letting the youngsters run buck-wild (sorry, couldn’t resist at least one bad pun). What humor there is to be found here is certainly more of the visual/ slapstick/ bodily harm variety, which, contrary to what the PG-rating suggests, clearly caters to the very little and/or easily amused. One could go as far as to say that the characters we know and love from the first film are so relegated to the background this time as to be not even necessary to the plot. Suspicions point to the notion that they were merely integrated so as to make use of the Open Season brand name. In all I came away from this one extremely disappointed. On its own it would have been an entirely average computer generated feature film but the fact that it desiccates the first movie in effort to achieve its sub par performance makes it that much harder to forgive. The tragedy is that commercial revenues have been strong enough to convince Sony Animation to give a third film of the franchise a go. Here’s hoping it more closely resembles the roots of the first one and not a continuation of this derailment. Back in 2006 when Sony Animation released Open Season, the formula of talking animal animated features was pretty sure-fire. Blue Sky was basking in the revenue the Ice Ages were bringing in, DreamWorks had Madagascar (and perhaps even more direct competition Over the Hedge) and even Disney wanted a piece of the pie with The Wild. 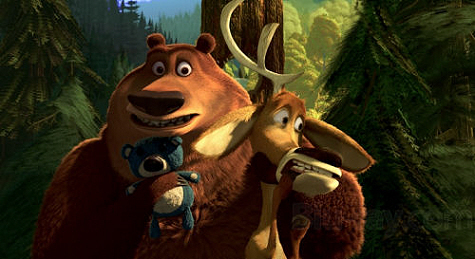 Sony had a pretty admirable basis with Open Season, however, one that kept it from being lumped with the others in the ideal that a domesticated grizzly bear could lose touch with all sense of instinct before being dumped back into the wild. Perhaps most impressive is that Open Season represents the first full length animated feature film to come out of Sony Imageworks (a company that would go on to produce many leading titles in the genre). A grizzly bear named Boog (Martin Lawrence), domesticated by a park ranger named Beth (Debra Messing) encounters an overly energetic deer named Elliot (Ashton Kutcher) in need of a hand to escape from the mullet-sporting, flannel wearing hunter, Shaw (Gary Sinise). Elliot decides to return the favor to help Boog escape from Beth’s humble abode, which leads to a big misunderstanding that convinces Beth that the time to release Boog back to the wild has arrived. Boog, it turns out, having been raised with humans from cub-hood, has no idea how to survive outside of his cozy garage. 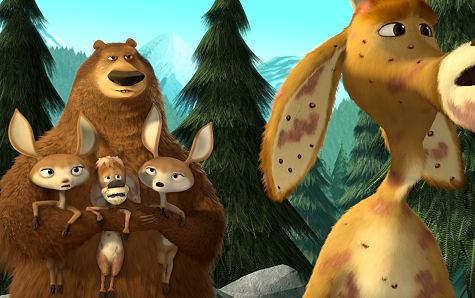 Despite some shaky beginnings, Elliott and Boog end up developing an unlikely bond that becomes extremely crucial in their teaming up with the other wild animals of the forest in attempt to drive out the invading hunters. 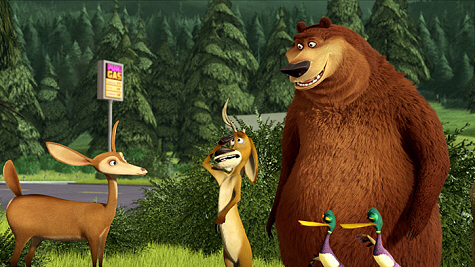 I came away pretty impressed from Open Season thanks to pacing that is neither forcefully fast nor too bogged down upon itself and a lenient enough script to allow the actors a chance to really bring some personality to the characters. The story itself is actually quite solid with enough subtle bits and gags to appear humorous to nearly any age group. Sure there’s the requisite slapstick to appeal to the younger demographic but some of the redneck references and pop culture influence will be sure to raise a chuckle out of adults as well. The visuals were top notch then and are still impressive even today with a lot of deliberate attention to lighting and shadow (especially in the outdoor environments). The featurette concerning the rendering of each character’s digital hair is a welcomed reminder as to just how tedious and time-consuming creating this type of film can really be. While I was expectedly pleased with Martin Lawrence and Ashton Kutcher’s vocal performances as they two lead characters (Boog and Elliott respectively), special props definitely have to go out to Gary Sinise for his most uncharacteristic portrayal of the hunting-obsessed human Shaw. There’s some genuine humor there that sets the tone for many of the onscreen antics to follow. Finally, the fact that the opening credits roll to Talking Heads’ Wild Wild Life is just precisely the attention to detail here that makes Open Season stick out among a crowded DVD shelf. In conclusion, it should really come as no surprise to hear that Open Season was successful enough to spawn not one but a pair of sequels (part 3 is nearly complete at the time of this review’s writing). An appropriate cast blended with an interesting story and tight visuals all adds up to a pretty rewarding experience. 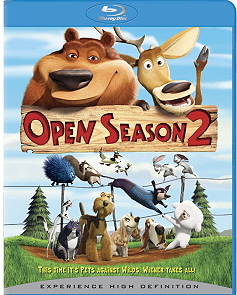 I’m looking forward to enjoying Open Season 2 next.